We take pride in the brands we offer. Many stores sell unhealthy and unsafe products that most vets would strongly urge you not to buy, and make it really difficult to distinguish among them. We don't believe it's right to sell any product that is unhealthy or unreasonably unsafe for dogs. For example, all of the food and treat brands we carry are made from only the finest ingredients, because unhealthy food and treats can cause a number of issues. Our retail prices are at the same levels or less than at other stores throughout Chicago. If you already come here for daycare, boarding, or grooming, it is a no-brainer to buy your food, treats, and other retail items from us. It is actually advantageous to do so if you board here, because if you need to extend your stay and run out of food, we can easily add another bag to your account. We offer a fairly broad selection in most of our product categories so that you have choice. For example, we carry numerous brands of quality dog food, all with different benefits and at different price points. 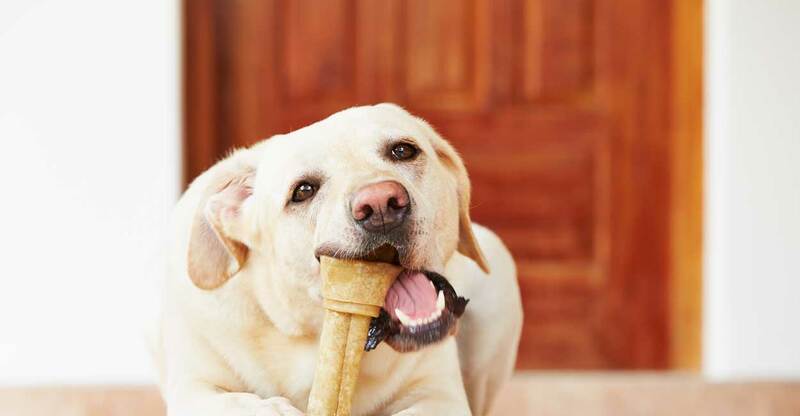 We also stock a wide variety of treats and chews so your dog doesn't get bored. In fact, we stock many of the same food and treat brands found at other pet stores throughout Chicago, so why drive the extra distance if you don't have to? In addition, we have a wide assortment of other types of products, from designer leashes and collars to daily consumables such as household cleaners. We have various promotions to help you get started with us, try new products, and to reward you for your loyalty. For example, in our Retail Loyalty Program, you'll receive a $15 credit for every $250 you spend on our retail items. You can use that credit towards any other retail purchases or services. We have a very sophisticated computer system that tracks what products you have bought from us. This can come in very handy if, for example, you or your spouse forgets what you normally buy and need to get another bag. If you buy food, treats, or any other product that your dog doesn't agree with, bring it back and we will offer a trade or refund (restrictions apply - see store associate). Most dogs will get diarrhea if you abruptly change their food. You must blend the old and new over the course of a week. Some people don't do this, and think their dog got sick from the new food, when that is not necessarily the case. If you need help getting a large bag of food or any other product out to your car, we will be happy to assist you.